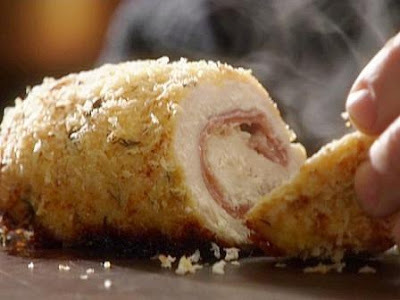 Start by pounding out your chicken breast between 2 sheets of plastic wrap or parchment paper. Lay down a few (thin) slices of ham on top of your chicken breast. Then add a layer of cheese. Roll the breast up. Dip it in melted butter. Roll in bread crumbs. Stick a toothpick or 2 through the middle of the roll. Put in a baking dish and bake uncovered @ 350 for 35-40 minutes depending on your oven. I usually serve this with baked potatoes and broccoli. This looks and sounds yummy! Thanks! this sound good!! thanks for sharing. Yummy! Will have to try it!